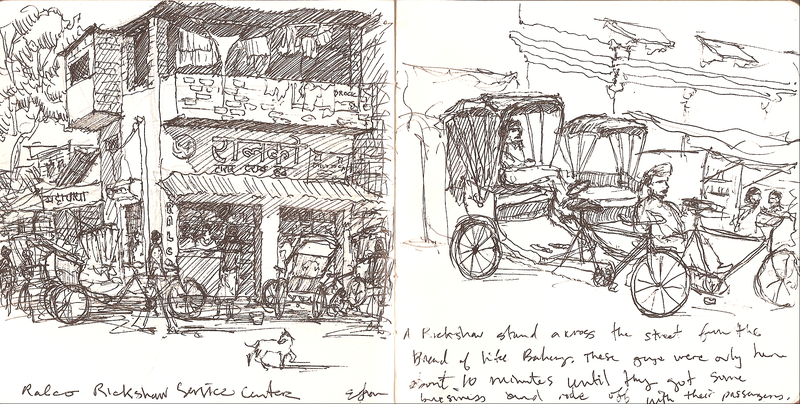 At the Ralco cycle rickshaw stand, I watch the rickshaw wallahs come and go. When they have some spare minutes they stop to drink chai, or get their tires pumped. The older rickshaw drivers are incredible, with legs that are literally the size of my forearm, they routinely pedal whole families of four – and I think my arms are skinny. Most don’t fit their cycle very well, barely reaching the pedals with their stick legs, and straining so hard you think the chain will surely snap. But in India anything is possible, “Bharat me, sab kuch milega“. It is definitely only a viable industry in flat cities, something I thought about a lot, being from hilly Seattle. Despite the hardship on the drivers, it really is an efficient eco-friendly way to cart multiple people around. Not that we don’t have ‘pedicabs’ in the States, but they are pretty restricted to tourist areas. All I know is that if Seattle were flat, I would have a rickshaw. I bet they could become trendy in Portland. These drawings are so beautiful and have a great deal of character. I like this urban scene. What about a hybrid rickshaw that is powered by used grease or a battery on the uphill?